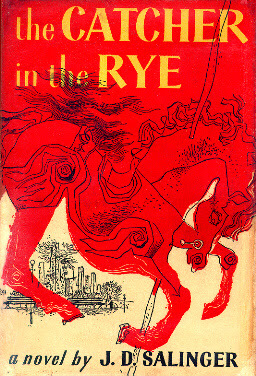 Bookride: J. D. Salinger. The Catcher in the Rye. J. D. Salinger. THE CATCHER IN THE RYE. Litttle Brown & Co.,Boston, 1951. Still avidly read even by youths of the IM generation. Teen angst, teenage wasteland etc., Considered obscene in its time and given a sinister vibe by its association with psychotic assassin Mark Chapman. Hard to tell what that did for the reputation of the book apart from make it even more famous. A reclusive and litigious author, but signed material does occasionally creep out including a questionnaire he filled in for a travel agent after a continental holiday (appears to have sold for $20K+.) Dealers selling letters and notes from him have learned not to quote them unless they want a lot of grief from his lawyers. The main way of telling if you have the proper first is the Lotte Jacobi photo on the rear (missing in later editions) + no 'Book of the Month Club' slug on front inner flap. The 'Book of the Month Club' issue can, however make awesome sums on ebay. Backpacker classic, the ultimate cult novel but watch out for phony jackets. VALUE? Not uncommon but not exactly a sleeper so always expensive. There is the tale of the East Coast bookseller in the 1980s who found a box full of the proper firsts - these have long been absorbed by the market. The kind of book bought by stars such as Pitt and Depp for their panelled book dens. Hard to find a nice one with d/w unclipped and with the $3.00 price for much less than $8K. Limpid copies way more. In auction the book has had spectacular and possibly unreproduceable results. Nice copies of the US first were making $100 in the 70s and a fine copy made $1500 as recently as 1992, and a 'superb copy' $15000 in 2003. The Neville copy made $25K signed in 2004. All part of an increasing trend for buying ( and investing in) cult classics: if you are going to spend this kind of money you might as well have something everybody has heard of. It may have topped out, although the market hasn't been tested recently by another superb example. 2 copies turned up in auction in 2006 both with slight wear, they made $3000 and $5250 (' d/j with tears & chips to edges & split to lower front joint - bdg with some rubbing'.) Inscribed copies are not as rare as they were - anything 'flatsigned' (ie signed but without inscription) is best avoided without ironclad provenance. There are several for sale with clipped signatues mounted in them, always faintly tacky and faintly unconvincing. Watch out for facsimile jackets. Likewise restored jackets unless at hard to resist prices. There is a chap online at present selling the first state jacket without the book for $7500. One day it will marry. Illustrated below is the UK first edition with a memorable jacket by the highly rated British illustrator Fritz Wegner. It is considered more attractive than the US jacket, the young man pictured looking oddly contemporary. It can sell for over a £1000 in sharp condition ( it made $3000 in a freak result at Christies NY 2002- a reasonable copy made $525 last year at Auction Explorer. I have seen these boxes and they are pretty well made but probably cost less than $1000 and I dont know what happened at that sale, poisonally I wdnt want one on my shelf. 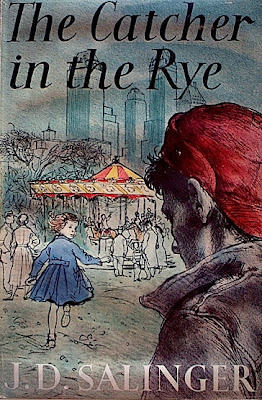 The Catcher in the Rye is not only a timeless classic, but also a story about a young boy on the brink of adulthood, finding the world full of hypocrisy and ugliness and wondering how he will fit in.